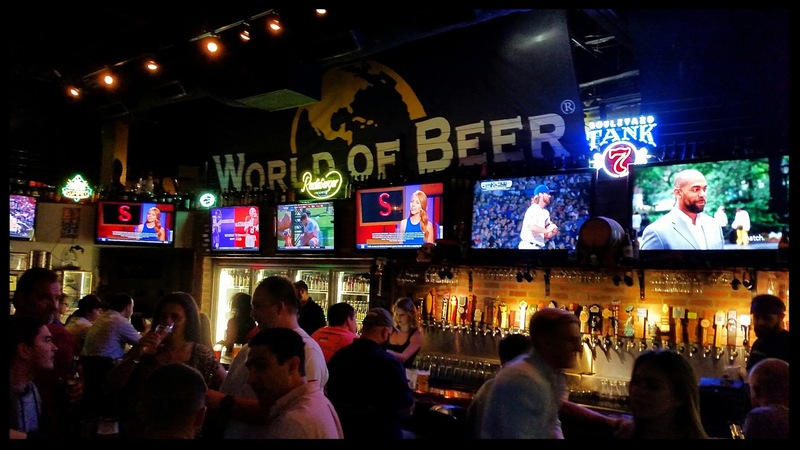 Most of us Floridians are very familiar with the craft beer chain known as World Of Beer, especially since they started in Tampa. Since opening that first location in 2007, WOB has grown to more than 70 locations in 20 states. What began as a neighborhood tavern to sample great craft beers and swap beer talk has grown into a unique cultural phenomenon celebrating the world of craft beers and camaraderie. Now, in addition to 500 craft beers and 40 rotating taps daily, WOB is changing the game once again with a variety of delicious food that pairs perfectly to whatever you’re drinking at the moment. World of Beer UCF’s newest addition, the signature “Tavern Fare” menu features a variety of elevated comfort food that provides the perfect marriage of food and beer for the ultimate experience. The “Tavern Fare” lineup of pub inspired foods has something for everyone with WOB tavern shares that include an authentic German Pretzel, Sriracha Lime Shrimp Tacos, Black and Blue Flatbread, Guinness Brat Sliders and Belgian Waffle S’Mores to name a few. The menu also has plenty of tasty and hearty sandwiches like the Chimay Burger, Chicken Pesto Sandwich and even a classic Reuben. This pretzel’s original Bavarian recipe was created by Germany’s most sought after artisan pretzel baker, Ossi Piller, and dates back more than 100 years. Served with house made stone ground mustard, this pretzel was delicious and fun to eat all at once. For an additional $2.00 you can grab the house made beer cheese, which was pretty awesome too. Try it with a Narragansett Pale Lager. The Spring Greens & Kale Salad features spring greens & kale with goat cheese, apples, sweet pickled red onions & candied pecans tossed in a Framboise vinaigrette. Pair it with St. Louis Premium Framboise. A very impressive Artisan Sausage Board was served up with a trio of jalapeño cheddar, cracked black pepper and hickory smoked sausages. Served with spicy pickled green beans, peppadew peppers & our house made stone ground mustard. Pair it with Hacker Pschorr Oktoberfest. Sriracha Lime Shrimp Tacos are stuffed with beer battered shrimp tossed in WOB’s homemade Sriracha lime aioli and served on tortillas with roasted corn and tomato salsa with shredded lettuce and fresh cilantro. Pair it with an IPA of your choice. The Belgian Waffle S’mores are light & crispy, fresh baked, Belgian beer-infused waffles with toasted marshmallow, drizzled with a Kahlúa fudge sauce, & topped with graham cracker crumbles & powdered sugar. These were a most awesome dessert. Try them with a Sprecher Imperial Stout. Priced between $5 and $15, every dish pairs perfectly with WOB-UCF’s vast selection of local and global craft beers, and are perfect to share with friends. At World of Beer, they want to take you on a taste journey so you can enjoy the great flavors and aromas of great beers, and enhance your experience with delicious food on the Tavern Fare menu. The combination gives you the ultimate craft tavern experience.